This interesting surname, of Anglo-Saxon origin, is a locational name from any of the various places so called. Several, in particular those in Hampshire, Kent and Devonshire, derive their names from the Olde English pre 7th Century "heort", hart, plus "leah" meaning "wood" or "clearing". The one in Northumberland derives its second element from the Olde English "hlaw" meaning "hill", and the one in Cumberland contains the Olde English "cla", claw, in the sense of a tongue of land between two streams, with an uncertain first element. The surname is widely distributed, but it is especially popular in Yorkshire. The surname dates back to the late 12th Century (see below). Further recordings include one Nicholas de Hertlegh in the 1327 Subsidy Rolls of Somerset. 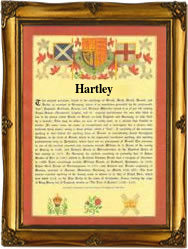 Variations in the idiom of the spelling include Hartly and Harteley. One Joane Hartley married William Egerton in 1547, at St. Peter's, Westcheap, London, and Christopher, son of Edward Hartley, was christened on October 28th 1561, at St. Michael's, Bassishaw, also in London. Mary Hartley, a famine emigrant, sailed from Liverpool aboard the "A. Lawrence" bound for New York on April 17th 1846. The first recorded spelling of the family name is shown to be that of Robert de Hertlay, which was dated 1191, in the "Pipe Rolls of Yorkshire", during the reign of King Richard 1, known as "The Lionheart", 1189 - 1199. Surnames became necessary when governments introduced personal taxation. In England this was known as Poll Tax. Throughout the centuries, surnames in every country have continued to "develop" often leading to astonishing variants of the original spelling.